My good friend/producer’s birthday rolled around, and I love getting the chance to make him a cake every year. This was my third cake for him. He loves a rich decadent dessert. While browsing a selection of cakes on Epicurious, I knew the instant I saw this triple layer cake, it would be perfect for Tony. The cake was moist, but not too wet; and very bouncy/spongey. It was rather delicate, and I wished I had followed the instructions of inverting it on cardboard rounds, as my first layer broke just a little. But I was more careful with the other two layers. Luckily I had planned to make the cakes 1 day before I made the frosting, so I wrapped them in wax paper, then plastic wrap, and put them in the freezer. About 12-16 hours later I moved them to the refrigerator. When I got ready to begin the frosting, I took them out of the fridge. This made them much more manageable to move and stack. The frosting was incredible. The method of preparing it involved first making caramel, which I’ve done before, and combining it with melted, cooled chocolate. RICH RICH RICH! The instructions specifically said “do not overbeat or frosting will become stiff and grainy”. And my frosting was doing fine, it was smooth and beautiful. I shut off the mixer to just scrape down the sides of the bowl to help combine some of the caramel and chocolate (hmm… sounds like I need a scraper blade! Like this one or this one, please Santa!). Then within seconds of turning the mixer back on, it was grainy! I (freaked out and then) followed their tip of setting the bowl of frosting over saucepan of simmering water for 10-second intervals, and whisked just until the frosting was smooth and spreadable. Whew! This cake, was truly exceptional! I’ve always wondered how to get that rich, delicious chocolate frosting like you get at a bakery. In my opinion, this hit the nail on the head! The Caramel Milk Chocolate Frosting was so sweet, but not overly sweet in the way a frosting made from powdered sugar and butter is; it was rich, and truly decadent. When combine with the dark, delicious flavor of the cake, it made for one awesome combination! This cake further emphasizes why I LOVE LOVE LOVE baking cakes from scratch. Every recipe produces a truly unique result. It’s worth all the time and effort, and the birthday boy sure appreciated it! Divide batter among prepared pans (about 2 1/3 cups for each). Smooth tops. Bake cakes until tester inserted into center of cakes comes out clean, about 22 minutes. Cool completely in pans on racks. Invert cakes onto 9-inch-diameter cardboard rounds or tart pan bottoms (cakes are delicate). Peel off parchment. Combine milk chocolate and bittersweet chocolate in large bowl. Stir sugar and 1/2 cup water in medium saucepan over medium heat until sugar dissolves. Boil without stirring until syrup is deep amber color, occasionally brushing down sides of pan with wet pastry brush and swirling pan, about 10 minutes. Carefully and slowly add whipping cream (mixture will bubble vigorously). Stir over low heat until any hard caramel bits dissolve and mixture is smooth. Pour caramel over chocolate; let stand 1 minute to allow chocolate to soften, then whisk until chocolate is melted and smooth. Chill chocolate-caramel frosting until completely cool, about 2 hours. Let stand 1 hour at room temperature before continuing. Using electric mixer, beat frosting just until color resembles milk chocolate and frosting is easily spreadable, about 1 minute (do not overbeat or frosting will become stiff and grainy). If necessary to correct graininess, set bowl with frosting over saucepan of simmering water for 10-second intervals, whisking just until frosting is smooth and spreadable. This time last year I was… making CUPCAKES for the same guy! As well as a homemade breakfast sandwich, and some holiday cookies, Buttered Rum Meltaways. What a delicious looking cake! 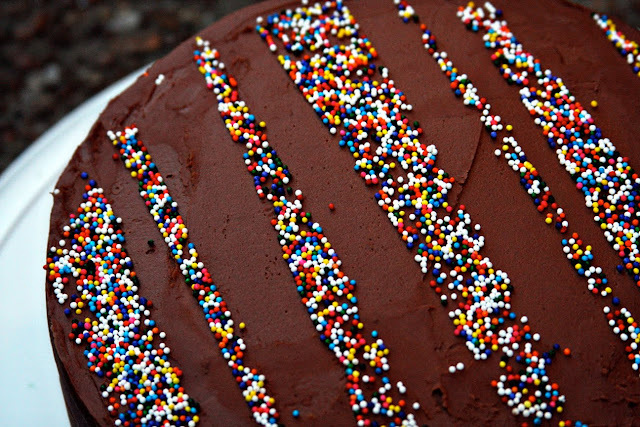 The sprinkles look so pretty! Ok so I know this is silly, but I love the Sprinkles on top! How adorable! I am so the Sprinkle Queen! I put them on whatever I can! WOW! What an amazing looking cake!! Wow. The cake is beautiful. I love the flavor of the frosting. Wow, this cake looks fantastic. It's been a while since I have baked a nice big comforting chocolate cake. I must make this soon. Mmm this cake sounds absolutely fantastic. And it looks so pretty too!